Posted January 16th, 2013 by David Porter & filed under MailBigFile, Sponsorship. MBF Blog-sponsored East Anglian Ironman triathlete Joe Skipper has posted his latest report on progress as a New Year message to his supporters. One of many things that strike about Joe’s report and his training regime is how he has to stay focussed on the three separate disciplines in equal measure. He has to decide priorities for training at any given time, make progress then move on to the next phase. And has to keep doing that all the time. He reports that before Christmas he did swim testing over 100m, 400m and 15 minutes to build up usable data to inform further training. His plan before the 2013 season starts is to swim the 100m in 59 seconds and the 400m in less than 4 mins 40 secs. If he does, it wont guarantee a place in the front pack but will increase his chances. As in previous reports, Joe says how important he feels it is to train closely with others to strengthen his timings and challenges. He ran the Cuevas Half Marathon on 2nd December, calling it a ‘more low key event than expected’ but he enjoyed a win and found the course more descending than climbing. It seems that every course is unique and adds something to his experience for later races. He then did three weeks training which included one race, ‘a cycling criterium’ round a 2.5 mile lap through a town for an hour. Again he worked as a team with others, and the winner picked up a huge Serrano ham, a bottle of wine and ‘Bane the pig’! He says that flying back home was a shock after being used to 22 degrees in Spain! However, he quickly climatised to take on a cross country race on Boxing Day and a 10km race on New Year’s Day in Wymondham. He came second in both. And he picked up his new bike, a Starley TT model, JKS t2 with SRAM red and it is super fast. He says ‘I can’t wait to start racing on it’. 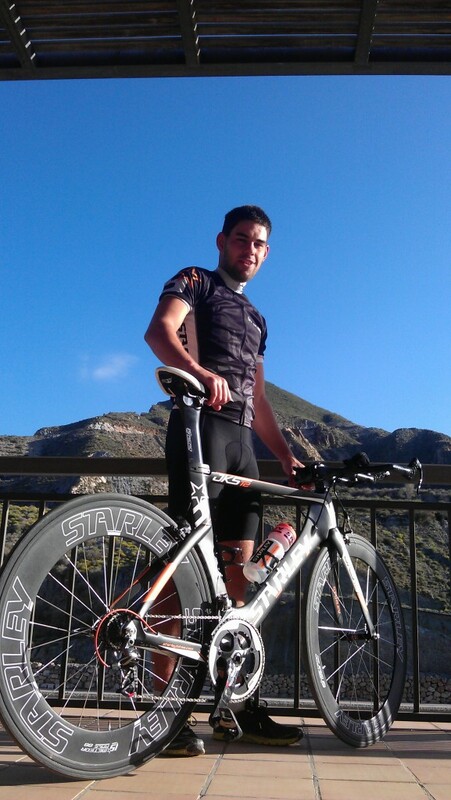 He expects his first triathlon of the year to be Elche on 14 April, rather than Abu Dhabi. That location is still a dream he wants, but as he says, ‘getting an entry into the race is out of my hands and there is nothing I can do about it’. His continuing optimism shines through and one of his New Year Resolutions is to update his blog more regularly. And in the meantime, he points out that anyone can join him and other triathletes in sunny Spain to escape the cold British winter….there is a special (short lived) deal at just 15 euros a night!